Do you hate one (or more) of your classes? I don’t mean mild annoyance or frustration with difficulty. I mean absolute hatred of the subject you’re learning? One of my clients truly detested a subject area she was learning, and we worked hard this year to convince the powers that be to take it off her plate. In this video, I describe how this one shift made a world of difference in her motivation at school… and why it might sometimes be appropriate NOT to force kids to suffer through a class just because it is a “requirement.” Especially in the case of this client, who tried HARD to like this class (she stayed in it for two years), it became apparent that a change was necessary. Tune in to the video to find out what class this was, and how letting it go turned things around for this client. I have one client in particular with whom I’ve been talking about motivation in very specific ways lately. This young woman has been with for 3 years, and in the first two years were quite a struggle; however, this last year things have been going extremely well. There are three main reasons for this change. The first reason is that she’s not doing the dance team this year, which has increased her free time; however, this wasn’t as nearly as important as the other two. Of the two other the first I’d like to discuss was the topic of last week’s video, “Why Working Out Helps You Be a Better Student“. As I discussed last week, this young woman enjoys working out, but more importantly, the cardio she’s doing this year seems to be helping her much more than the dance team did last year. And as we discussed in that video, there has been a marked increase in her motivation to complete her homework when she’s getting regular daily exercise as compared to when she isn’t. With that said, the final and most important change from to this young woman’s school life that has drastically increased her performance was the removal of a class she simply detested. For her freshman and sophomore year, she was taking French, and she simply hated it. She hated the way the language sounded, she hated speaking it, etc. She simply didn’t like the language. Finally, the adults helping her, myself included, got the picture and she was able to drop French in exchange for taking Sign Language at her local community college. You see, there’s something about when you absolutely hate a class and how it ends up tainting everything else. When you hate something heavily, it ends up draining your energy. So if you or a student who you know and love is in a situation where they simply can’t stand a class and it’s affecting their other grades as well, you might want to experiment with removing that course or changing it out. 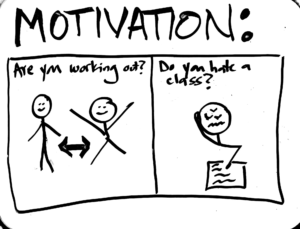 And if you feel like you need help with motivation or tips for studying in a class you have trouble with, please consider checking out my course, The Anti-Boring Approach to Powerful Studying™.